It’s quite sad to realise that not everyone knows the importance of a front entrance – after all, it is quite literally the ‘first impression’ space of a house which immediately informs guests of what sort of style (and, to some extent, people) to expect from the home they’re about to enter. 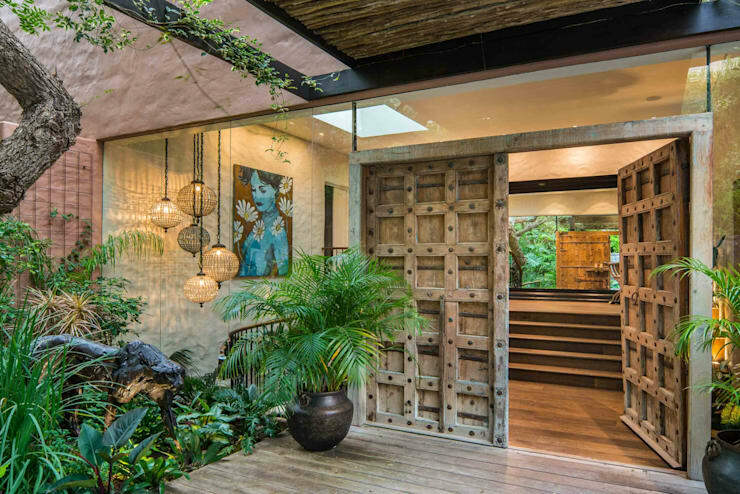 So, to serve as some design inspiration for your home’s entrance (both inside and outside), and also because we know you just love to look at photos of beautiful spaces, find herewith 10 noteworthy entrance that can be found in South African homes. 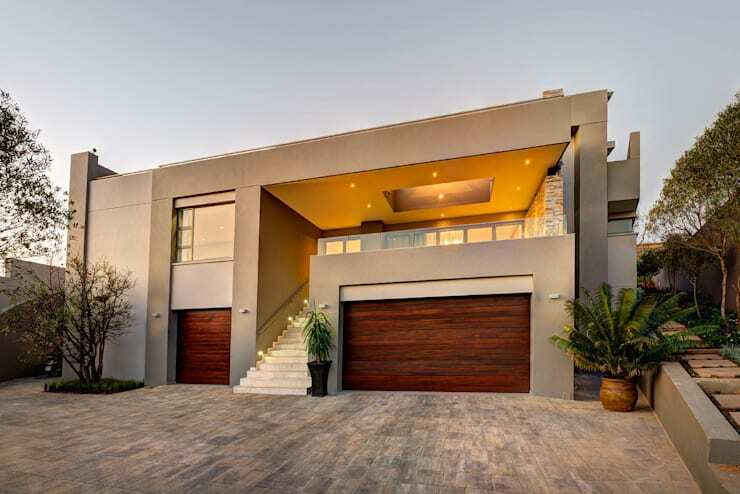 We start off with a house in Craighall Park, Johannesburg, which opted for the modern style and all its relevant touches: neutral hues (save for the bright red which serves to enhance the neutral colour palette), linear designs, open spaces and no overly embellished surfaces. 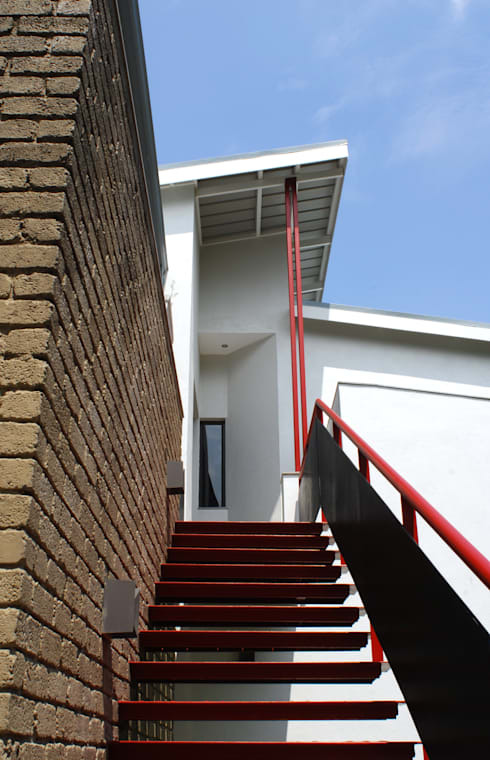 And how many homes can say that their front entrance is located at the top of a modern, open-riser staircase? The beautiful thing about interior design is that it does not restrict us to just one particular style – throw a bunch of them together (within reasonable limits, of course), and you can end up with the unique eclectic look. 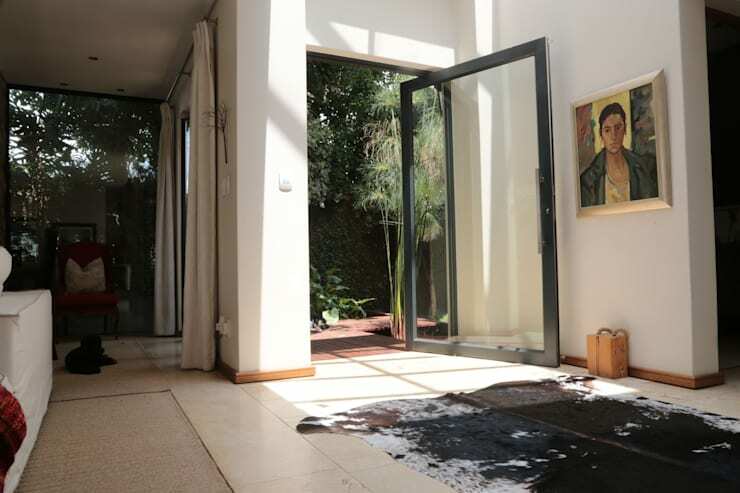 That’s exactly what this Cape Town home opted for: to welcome us with Spanish plastered walls, wrought-iron balustrades, numerous greens and an abundance of rustic timber for a truly unforgettable front entrance. Ah, the wonderful Scandinavian design style, which makes expert use of wood, clean surfaces and only a hint of colour or pattern for visual emphasis. It seems to work wonderfully well in this family home located in Cape Town, with crisp-white walls and an open-riser staircase going to great lengths to make this area seem even more open and bright. And we love the dark coating on the right-hand walls which ensured a bit of colour contrast! 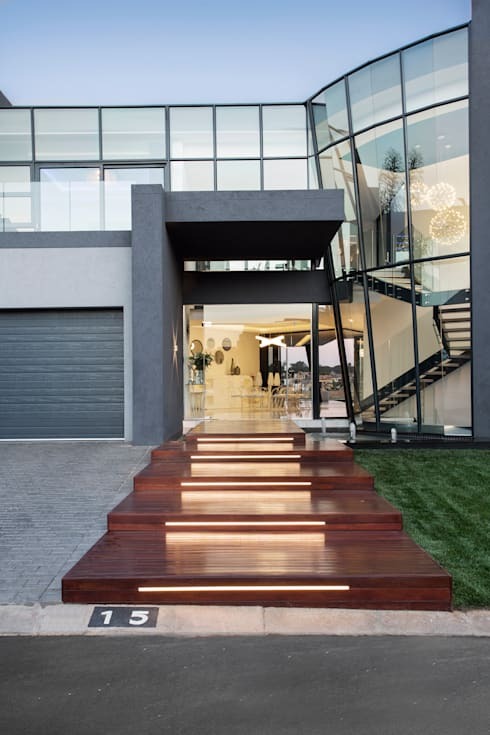 Back to Johannesburg for this entrance, which shows us how effective any interior space can be once the exterior landscape views are brought indoors. Thanks to floor-to-ceiling windows and a majestic glass door, this front entrance has no worries about being labelled ‘dark’—or ‘dull’ for that matter, judging by the unique approach to wall art and floor rugs. 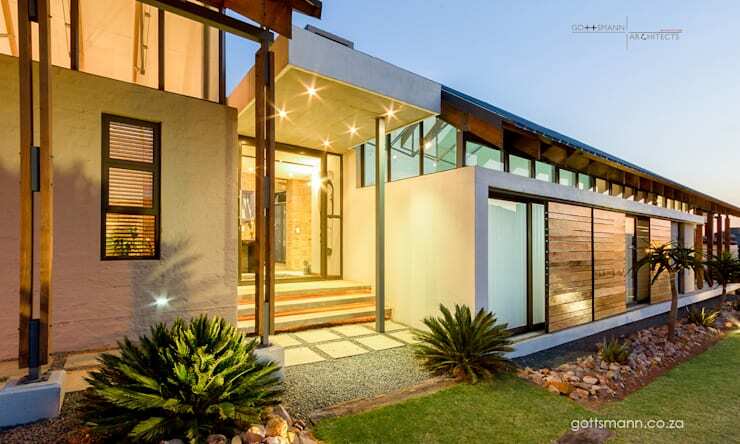 This clean-cut, modern house in the Serengeti Golf & Wildlife Estate in Kempton Park, Johannesburg, shows us how stylish a myriad of vertical- and horizontal lines can seem. However, it also teaches us how fantastic an outdoor setting can become once the right lighting fixtures are added. Notice how the lights casting warm glows on the timber-clad garage doors combine with the dazzling wall fixture at the front entrance – and how these, in turn, enhance the glowing spots jumping out from the lush, main-door garden setting. You can bet that once a house is built on a sloping landscape, it can present challenges in terms of access or structure. 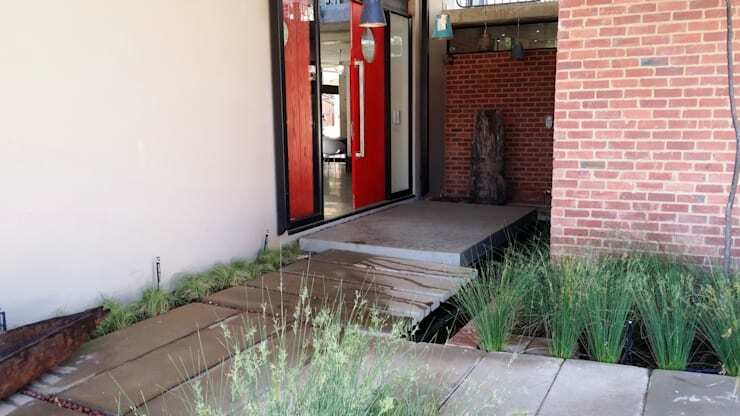 Well, we always love a good design challenge, which is why we are so crazy about this Johannesburg beauty with its multiple levels, and how it effectively overcame its access challenges. Besides, can you imagine standing in front of that glass door (up the front stairs) with the glittering cityscape in the background? 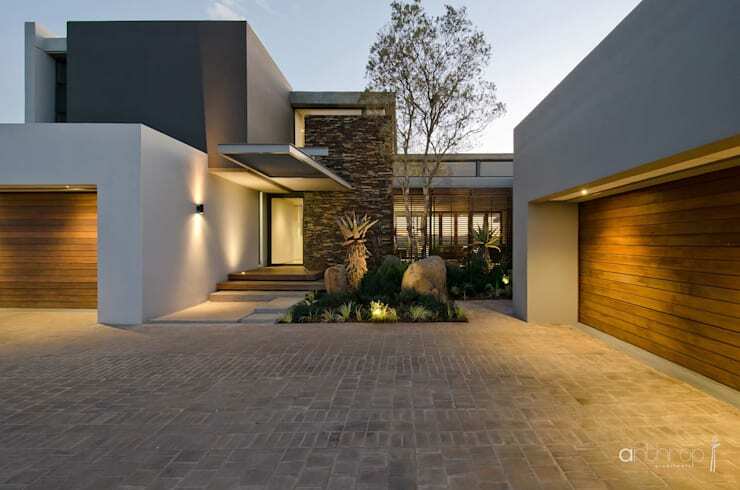 The designers of this Johannesburg home opted for a fresh twist by merging contemporary elements with a more country-style setting – and this translates through to the entire house, including its exterior façade and front entrance. The end product? A dazzling display of colours, textures and materials. Now where would one go to enter this Pretoria house? Well, it depends on whether you want to access the ground level (in which case you go knock on the door adorned with a rich-hued wood on the left) or the upstairs storey (for which you need to travel up the crisp-white staircase). Front entrance(s) aside, we just love the crisp and concrete lines which frame this structure as a design feature – and a most sophisticated one at that! If you put R25 million down for a house, you’d want all your spaces (both inside and outside) to look rather nice, right? 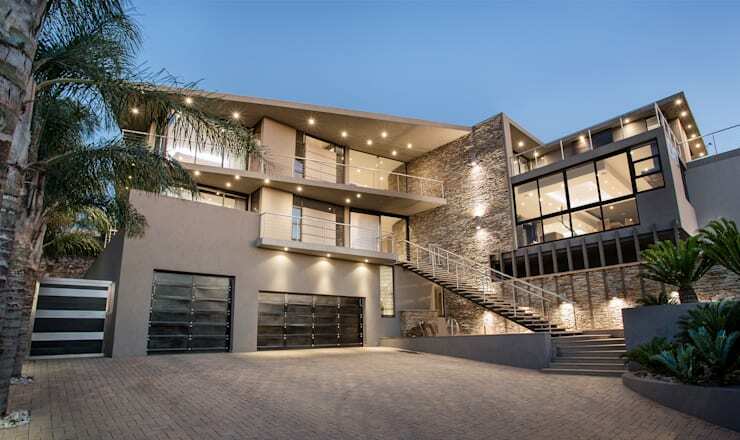 Well, this Johannesburg house has no qualms about that, for it features a state-of-the-art, ultra modern look which perfectly portrays the glitz and glamour that the city offers its inhabitants. After all, how many houses can boast a front entrance which resembles a timber-clad, brightly illuminated, multiple-levelled catwalk? For our last property, we return to good ol’ Pretoria to see a modern house which beautifully (yet subtly) combines textures for an eye-catching look. An exposed brick wall injects just the right amount of raw appeal into the façade (made even more striking by the hot-red colour of the front door), which contrasts rather marvellously with the soft plants that spring up all around us as we approach the home’s entrance. And as far as first impressions go, we’d say this house definitely has all the right touches to make us want to see more! To continue keeping up appearances, let’s see these 13 houses with gorgeous front entry paths. Which of these front entrances would you copy?